He's gonna save the world....of all it's money! He's stouter than an iron burrito, he's studlier than a snow tire, he's WAAAARIO MAN! Wish they'd got a better recording though. Best WarioWare song. I'm going to play this every single time if I become a DJ. Gotta give the game major credit for having a unironically climactic final stage and how the music is a surprisingly epic dark reprise of Gold's main theme. 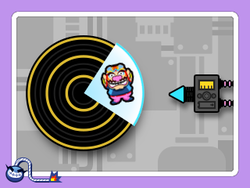 This is honest to god, already one of my favorite tracks in the WarioWare franchise, I know it's kinda of a hot take as Gold was only released in NA yesterday and all that, but it's such a surprisingly badass, motivating and climatic track that perfectly sets the tone of Gold's final stage. Nintendo, Please put this in Super Smash Bros: Ultimate or a future Super Smash Bros game in some form. I'll be disappointed if they don't, Seriously, It's a perfect fit IMO. I'm still giddy over the fact that we now have all WW vocal tracks in uncompressed form, thanks to WarioWare Gold, such a cool thing to put into the souvenir section. It's weird how the rest of the WarioWare Gold soundtrack hasn't been ripped yet. Usually these games ripped and uploaded as soon as they come out. I'd love to hear all the microgame jingles on their own. And the Pyoro remixes of course! from a bright, happy trumpet tune to a more heavy sounding electric guitar sound. The Jimmy T. microgame High Hoops feautures the same music, but in this one, they kept the original intact. The trumpet one always reminds me of Toy Block Tower for some reason. The Jimmy T. microgame High Hoops feautures the same music, but in this one, they kept the original intact. Actually, that's something I really love about this game that I've been wanting to bring up. Often when multiple microgames use the same song, instead of just copying it, they make 2 renditions of it. So one can be more faithful to the original and one more remixed. I love that. Best of both worlds. They didn't have to do that, but they did. They went the extra mile. Which is what makes the cut off loops mentioned above even harder to understand. The digestion microgame and the tooth picking microgame also used the same song in Twisted but now have different ones. And the digestion one sounds basically the same as in Twisted and I love that!